Tomorrow is Bill Gates’ last day at Microsoft in a full-time position. It’s what he’s known for the last several decades. 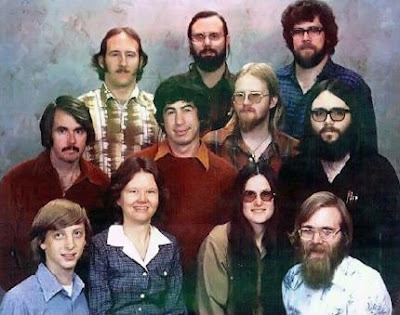 In 1978, when Microsoft was three years old and based in Albuquerque, New Mexico, there were only a dozen people working for the company - compared with the current number of almost 90 000 employees worldwide. Here we have 11 of the early pioneers, in a photograph that has evolved from a snapshot to become a historic document. 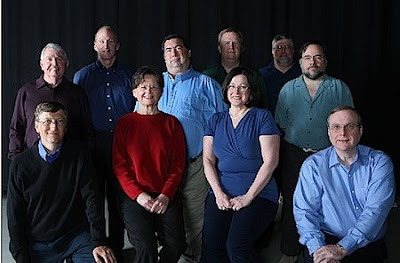 Recently the gang (even though all of them but Gates have left Microsoft) got back together for a reunion, and a new picture was taken. All are pictured in the updated picture except Bob Wallace who died in 2002 (back row, middle in the original), and they are all standing in the same spots. They managed to emerge out of the 70’s pretty well, didn’t they? It was definitely a smart thing for them to get together and re-take the picture, because now it will be even more memorable.